Everything you need to know about Anne Hathaway, William Shakespeare’s wife and the woman who inspired Carol Ann Duffy’s famous poem. Romeo and Juliet, Othello and Desdemona, Rosalind and Orlando - romantic relationships are at the heart of many of William Shakespeare’s best-loved works. Now in his new film, All is True, veteran actor and director Kenneth Branagh tells the lesser-known tale of Shakespeare’s own great love: his wife of over thirty years, Anne Hathaway. Before you check out the film, read more about the true story of William Shakespeare and Anne Hathaway. Who was William Shakespeare’s wife? Born in 1556, Anne Hathaway is thought to have grown up on a 90-acre farm in Shottery in Warwickshire, a short distance from her husband’s hometown of Stratford-upon-Avon. The oldest daughter in a large family, it is thought that Anne’s mother died when she was around 10. When Anne’s father died in 1581, he left a small sum of money to her in his will, which he dictated she should use to marry. When and why did they get married? William Shakespeare and Anne Hathaway married in 1582, when Anne was already several months pregnant with their first child. The marriage was considered unusual at the time, as William was just eighteen years old and so had to obtain his father’s permission to marry Anne, who was 26. To avoid the scandal of having a child out of wedlock, the couple obtained permission from the Bishop's Court in Worcester to speed up proceedings and so married outside of their home parish. Subsequently, no records exist of where the wedding actually took place. How many children did William and Anne Shakespeare have? William and Anne’s first daughter, Susanna, was born six months after her parents married and was baptised in Stratford-upon-Avon on 26th May 1583. The following year, Anne became pregnant with twins and Judith and Hamnet Shakespeare were born in 1585. Soon after the twins were born, Shakespeare left the family home, travelling to London to pursue a career as an actor and playwright. Much has been made of the nature of William and Anne’s relationship in these intervening years; they had no more children together and lived apart until Shakespeare returned to Stratford sometime after 1611. Were William Shakespeare and Anne Hathaway related? Although they grew up just miles away from each other in Warwickshire and both had large extended families in the region, there is no evidence that Anne Hathaway and William Shakespeare’s families were related. Much of the speculation surrounding the nature of Anne and William’s relationship and marriage stems from the contents of William’s will, famously examined by Carol Ann Duffy in her 1999 poem, ‘Anne Hathaway’, from her collection The World's Wife. When he died on 23rd April 1616 (which was also his 52nd birthday), the only item that William Shakespeare left to his wife was his ‘second best bed…’. Although this could be seen as a mark of disdain, scholars of the period have pointed out that as the first bed was often reserved for guests, the Bard is referring to the marital bed and so the gesture instead shows Shakespeare’s affection for his wife. Anne outlived her husband and remained in their house until her death on 6th August 1623. William and Anne are both buried in the graveyard at the Church of the Holy Trinity in Stratford-upon-Avon, England. The Shakespeare Birthplace Trust now owns the cottage in which Anne Hathaway grew up (shown in photo above), running it as a museum dedicated to her and William's legacy. Visitors to the 500-year old house and gardens can learn about Anne's early years and her life with William, visit the tearooms, and follow the garden’s sculpture trail, which features depictions of famous Shakespearean characters. 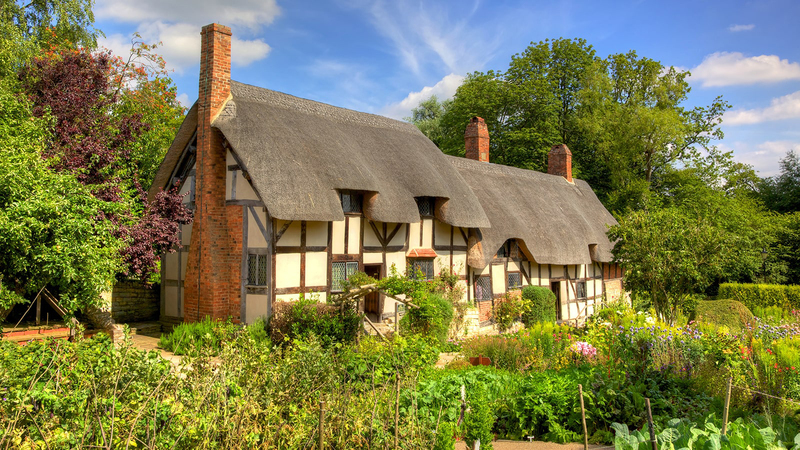 Find out more about visiting Anne Hathaway's cottage here. Directed by and starring Kenneth Branagh as the Bard, and Judi Dench as Anne Hathaway, All Is True is out in the UK cinemas now. Explore Macmillan Collector's Library's Shakespeare editions here.